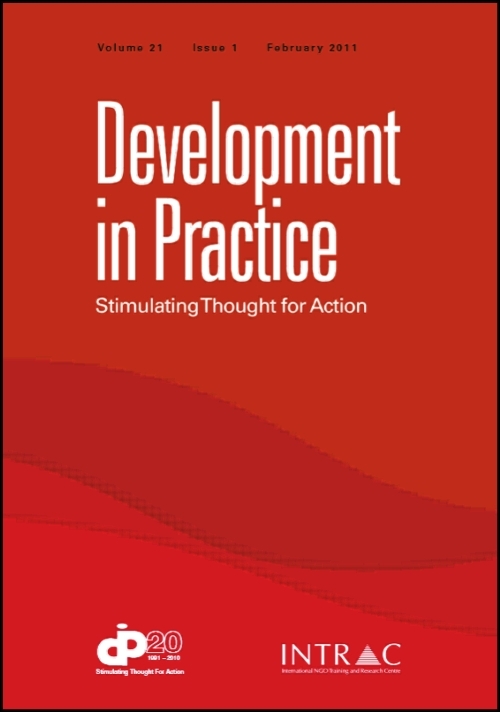 This special issue of Development in Practice (Volume 26, Number 5, August 2016) focuses on the challenges faced by civil society to remain sustainable in response to major changes in the global environment. With contributions from academics and practitioners from around the world, this special issue provides original articles, practical notes and viewpoints on the diverse challenges to civil society sustainability in different contexts. These include challenges posed by the reduction and often removal of external funding, as well as the impacts of restrictions on the operating space for civil society. The issue was edited by Rachel Hayman and Brian Pratt and includes articles written by INTRAC staff, associates and friends, and features four freely accessible papers. Download “Civil society sustainability: facing up to new challenges in organisational legitimacy, credibility, and viability”.